Having formed just over two years ago, the team of University staff players came from a background of little or no netball experience. With the intent to try something new and get active during their lunch breaks at the University of Kent, each player has thoroughly enjoyed the sessions and have seen improvements in their skills and overall fitness. Kent Sport staff member and Unicorns coach Sadie Appleby has taken the team from strength to strength: "I am absolutely thrilled to coach a team of such fantastic ladies. Each one has made huge leaps with their skills and I really look forward to where the team can go in the future!" All the Unicorns have shown commitment and determination in training sessions, have improved their knowledge and skills and shown outstanding sportsmanship in every match. This hasn't gone unnoticed and is regularly commented on by umpires, other teams and the league committee. 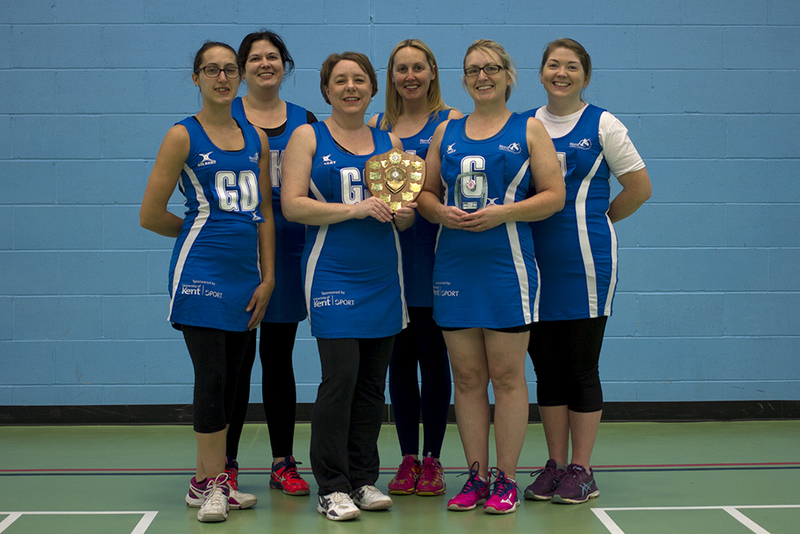 With their shining reputation it was no surprise that Kent Unicorns were awarded 'Team of the Year' at the Thanet and District Netball League presentation evening – a great accolade and a fitting tribute to their determination. Congratulations to the Kent Unicorns and we look forward to seeing what the new year brings! Fancy playing netball? If you're looking to get active, have fun and learn new skills, Kent Sport run open staff netball sessions each Monday at 1pm in the Sports Centre – just £2 per session with a Bronze membership (free for Gold and Silver Kent Sport members). See membership options.